One of Ellyn's favorite food. Heat oil in a large, heavy-based saucepan over medium heat. Add onion and garlic. 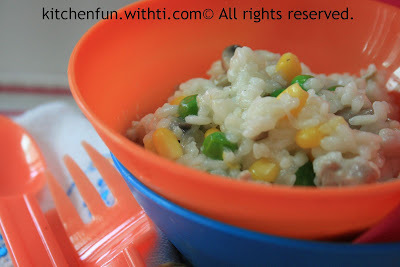 Cook, stirring often, for 5 minutes or until soft, add mushroom. Add rice. Cook, stirring, for 1 minute. Meanwhile, pour stock into a saucepan. Cover and bring to the boil over high heat. Reduce heat to low and keep at a simmer. Keeping rice mixture at a constant simmer, add simmering stock, 1 ladleful at a time. Stir with a wooden spoon until all liquid has been absorbed. Repeat with remaining stock, adding peas and corn with the last ladleful. Remove from heat. Add salt and pepper. 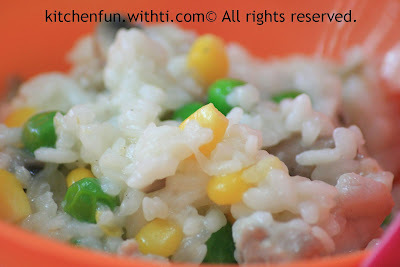 Stir to combine (rice should be tender but firm in the centre and risotto should be creamy in texture). Spoon into bowls and serve. dettha: suka jagung ya Det?